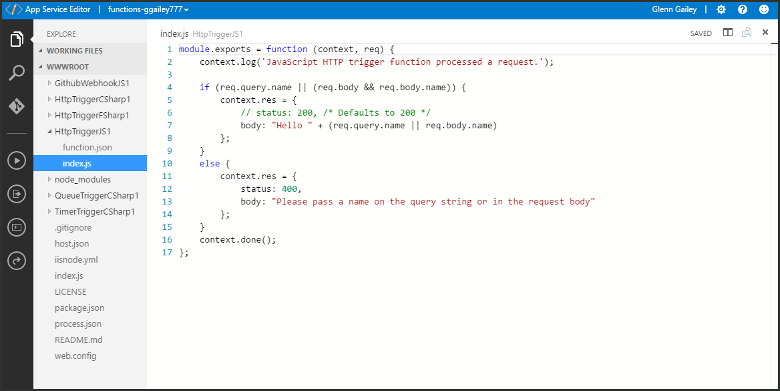 In Azure Functions, a function app provides the execution context for your individual functions. Function app behaviors apply to all functions hosted by a given function app. 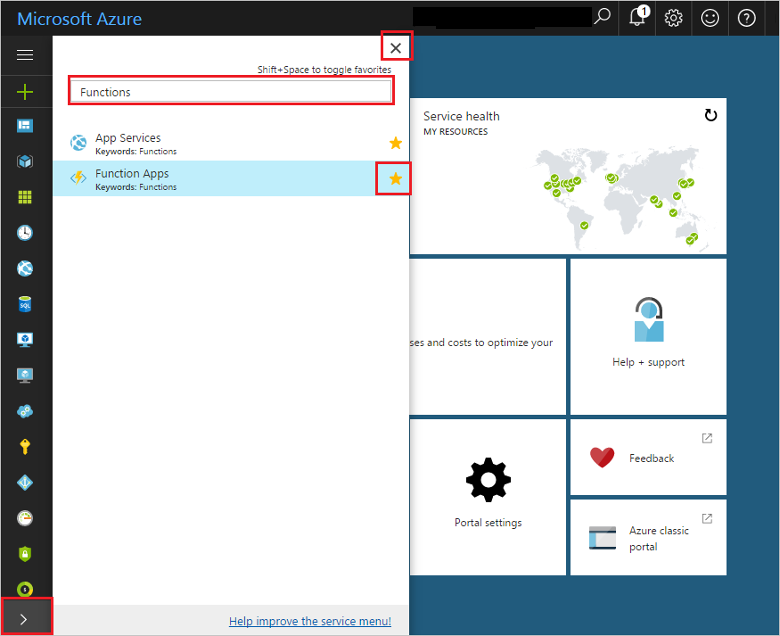 This topic describes how to configure and manage your function apps in the Azure portal. It can sometimes be hard to find your resources in the Azure portal. To make it easier to find the function apps you have created, add Function Apps to your favorites in the portal. Click the arrow at the bottom left to expand all services, type Functions in the Filter field, and then click the star next to Function Apps. This adds the Functions icon to the menu on the left of the portal. Close the menu, then scroll down to the bottom to see the Functions icon. Click this icon to see a list of all your function apps. Click your function app to work with functions in this app. The Settings tab is where you can update the Functions runtime version used by your function app. It is also where you manage the host keys used to restrict HTTP access to all functions hosted by the function app. Functions supports both Consumption hosting and App Service hosting plans. For more information, see Choose the correct service plan for Azure Functions. For better predictability in the Consumption plan, Functions lets you limit platform usage by setting a daily usage quota, in gigabytes-seconds. Once the daily usage quota is reached, the function app is stopped. A function app stopped as a result of reaching the spending quota can be re-enabled from the same context as establishing the daily spending quota. See the Azure Functions pricing page for details on billing. 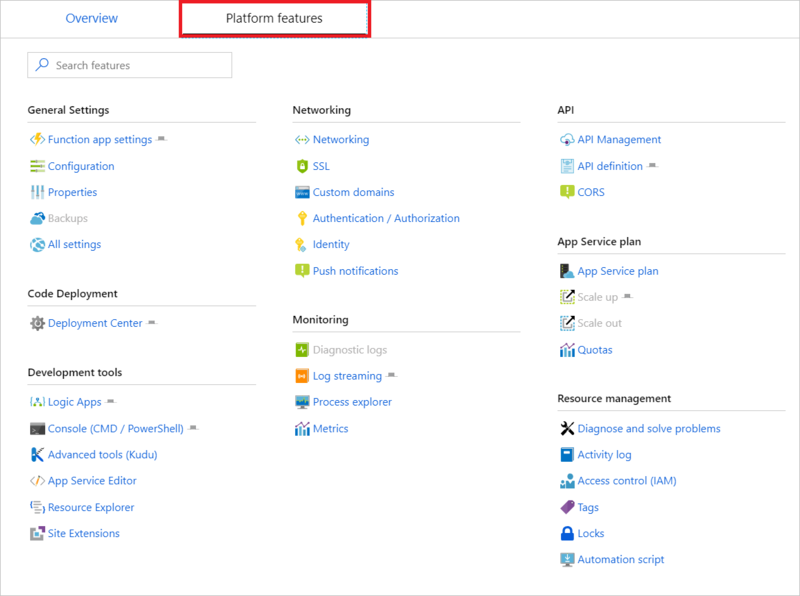 Function apps run in, and are maintained, by the Azure App Service platform. As such, your function apps have access to most of the features of Azure's core web hosting platform. The Platform features tab is where you access the many features of the App Service platform that you can use in your function apps. Not all App Service features are available when a function app runs on the Consumption hosting plan. 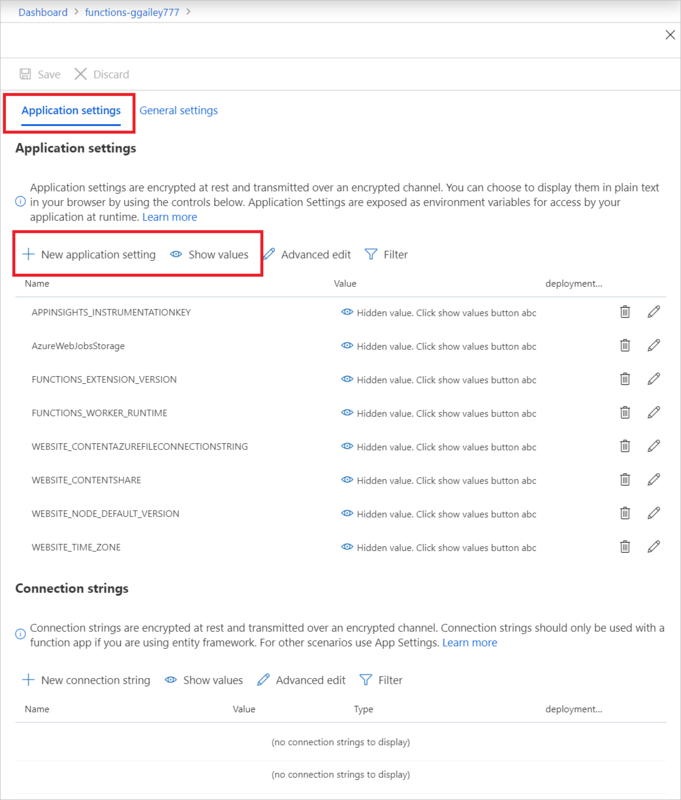 For more information about how to work with App Service settings, see Configure Azure App Service Settings. The App Service editor is an advanced in-portal editor that you can use to modify JSON configuration files and code files alike. Choosing this option launches a separate browser tab with a basic editor. This enables you to integrate with the Git repository, run and debug code, and modify function app settings. This editor provides an enhanced development environment for your functions compared with the default function app blade. 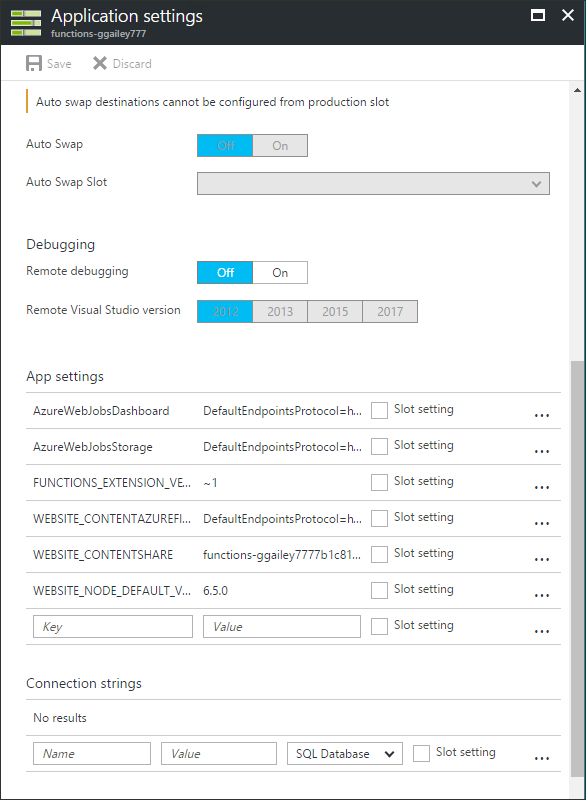 The App Service Application settings blade is where you configure and manage framework versions, remote debugging, app settings, and connection strings. 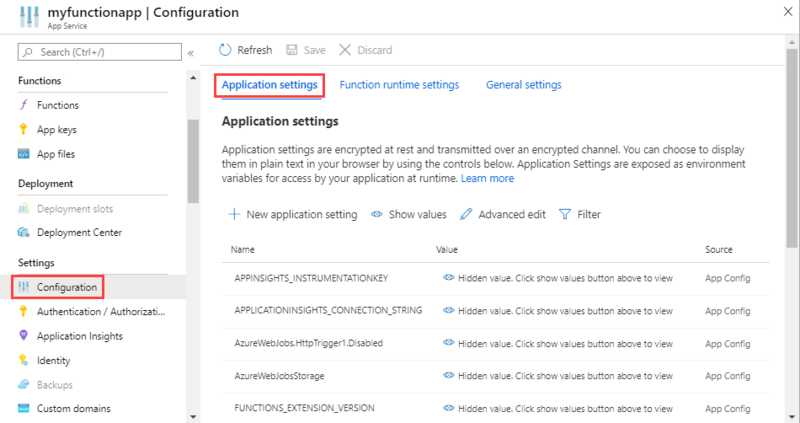 When you integrate your function app with other Azure and third-party services, you can modify those settings here. To delete a setting, scroll to the right and select the X icon at the right end of the line (not shown in the following image). 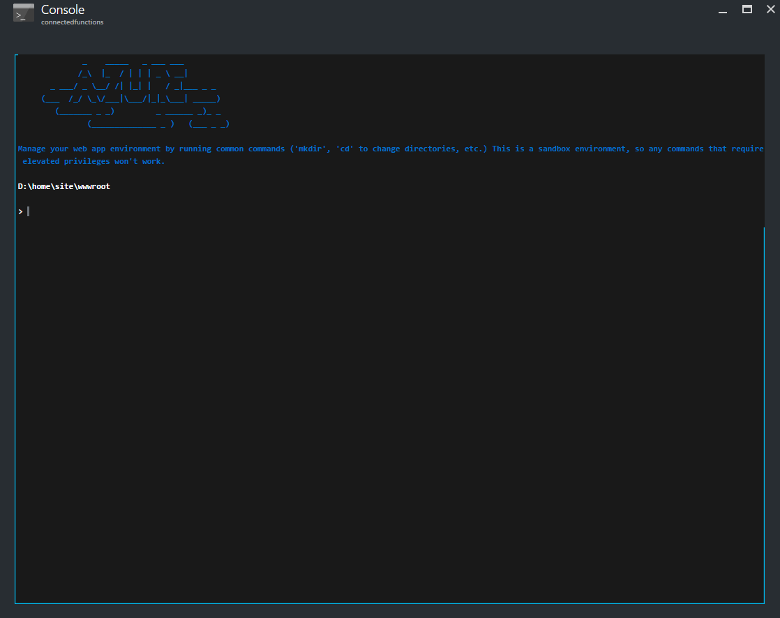 The in-portal console is an ideal developer tool when you prefer to interact with your function app from the command line. Common commands include directory and file creation and navigation, as well as executing batch files and scripts. 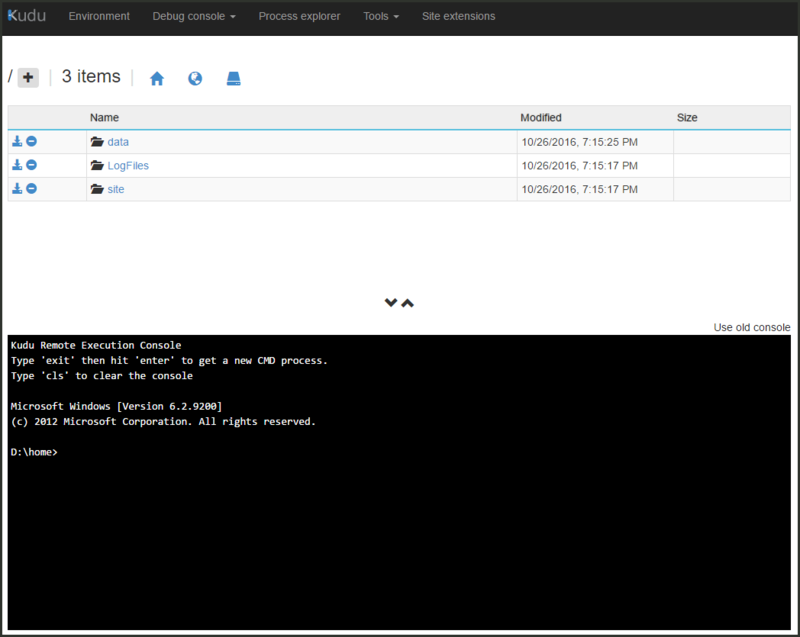 Functions lets you develop your function code on your local machine. You can then upload your local function app project to Azure. In addition to traditional FTP upload, Functions lets you deploy your function app using popular continuous integration solutions, like GitHub, Azure DevOps, Dropbox, Bitbucket, and others. For more information, see Continuous deployment for Azure Functions. To upload manually using FTP or local Git, you also must configure your deployment credentials. To prevent malicious code execution in your services, App Service blocks calls to your function apps from external sources. Functions supports cross-origin resource sharing (CORS) to let you define a "whitelist" of allowed origins from which your functions can accept remote requests. When functions use an HTTP trigger, you can require calls to first be authenticated. App Service supports Azure Active Directory authentication and sign in with social providers, such as Facebook, Microsoft, and Twitter. 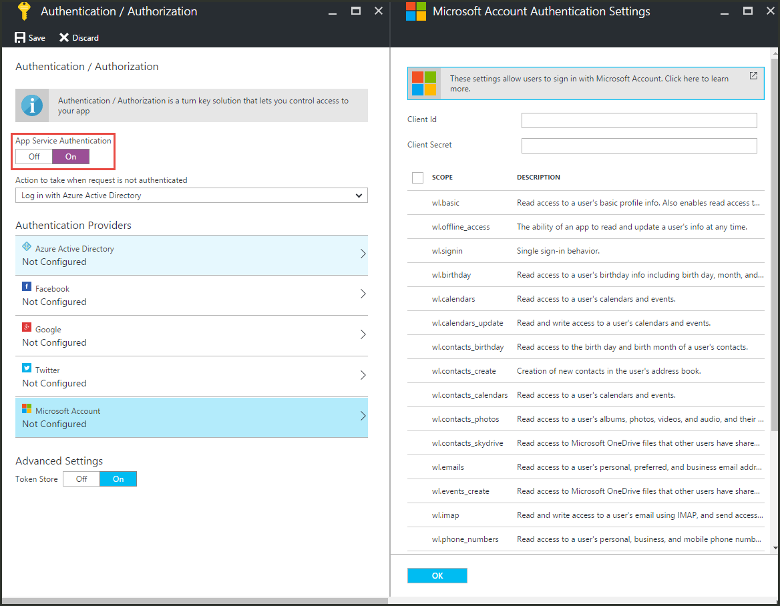 For details on configuring specific authentication providers, see Azure App Service authentication overview. Functions supports Swagger to allow clients to more easily consume your HTTP-triggered functions. 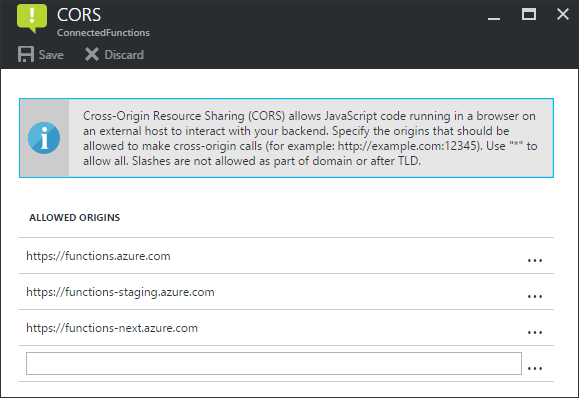 For more information on creating API definitions with Swagger, visit Host a RESTful API with CORS in Azure App Service. You can also use Functions Proxies to define a single API surface for multiple functions. For more information, see Working with Azure Functions Proxies.